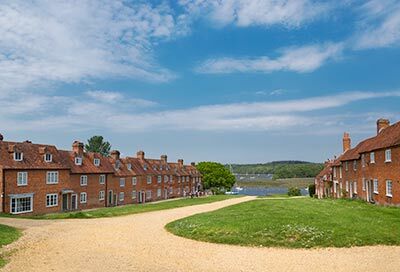 Located alongside the Beaulieu River, close to the end of its journey from Lyndhurst to The Solent, the charming, historic shipbuilding hamlet of Buckler's Hard is situated 3.25 kilometres (2 miles), or so, south-east of Beaulieu. There, twin rows of picturesque red brick cottages face each other across a wide, part-grassed corridor, little hinting at the significant part that they once played in Britain's heroic sea-faring past. Originally conceived in the first half of the 18th century by John, second Duke of Montagu, as Montagu Town, what is now Buckler's Hard was to be a settlement and docks used for ship-building and refining sugar. The 'refining sugar' part of the plan failed to come to fruition, however, and it is for ship-building that Buckler's Hard was to become best known. 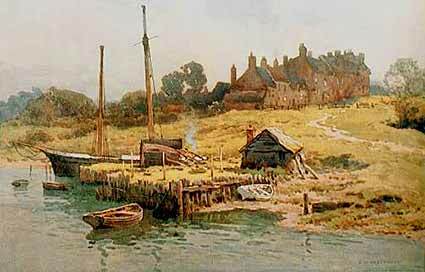 Today, the Buckler's Hard Maritime Museum and Buckler's Hard Story provide a fascinating insight into the history of the village and its ship-building past, whilst the re-created interior of a shipwright's cottage demonstrates living arrangements in those far off days and compares them to the cramped home of a labourer's family. Discover here how warships were built for Nelson's Navy and see models of the Buckler's Hard ships which took part in the Battle of Trafalgar. There's also an opportunity to view Nelson artefacts, including his baby clothes! Times change, though, and so did Buckler's Hard - from a busy ship-building centre to a rural hamlet that was to go on and play an important role in the World War Two, D-Day Landings. And, of course, change was to continue right up to the present day when the village is rightly popular with visitors from far and wide. Located amidst the row of cottages on the western side of the main street, St Mary's Chapel is of modest size with seating for a mere 40 people. Although still in use as a private chapel owned by the Montagu family, it is open to visitors throughout the year. Those in need of refreshment will welcome the presence of a tea room and a hotel with charming public bar and restaurant. The latter, the Master Builder’s House Hotel, was originally the home of Henry Adams, Buckler's Hard's Master Shipbuilder, and offers a popular choice of food, drink and accommodation. Visitors who wish to further sample the nautical life can, from Easter to October, take a trip on the beautiful Beaulieu River; whilst others might simply prefer to enjoy woodland or riverside walks. To reach Buckler's Hard, the energetic with time to spare can enjoy a pleasant walk or cycle ride from Beaulieu village along a section of the Solent Way - full route details are here. Others might prefer to drive along country lanes to Buckler's Hard. (1 - leave the village heading south along the High Street - travelling away from the Montagu Arms Hotel; 2 - turn left at the first 'T' junction; 3 - after a short distance, take the first turn on the left; 4 - go left at the first fork in the road; 5 - ignore a further road to the right and continue on until Buckler's Hard is reached). (Zoom in on the Beaulieu section of the New Forest map for a larger scale view of the routes). Be sure to check here for the latest information about Buckler's Hard.